In today’s rapidly changing world, the role of real estate has been affected deeply. To such a degree that the Center for Urban Real Estate at Columbia University sees an opportunity to transform the profession from within, stressing its creative potential and introducing an ethical code. 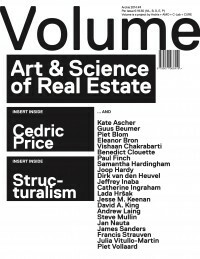 This issue of Volume is dedicated to CURE’s ambition to create a continuum between architecture and real estate, as part of the design disciplines. To add yet another perspective, this Volume dives into the archives and presents some architects who actively tried to crack the nut of the building as object, as real estate commodity, and create a more flexible relation with the users. This part of Volume comes in the form of two inserts. The first focuses on the work of the British architect Cedric Price, in connection to the Price exhibition at Bureau Europa, Maastricht. The second addresses Dutch structuralism, as presented by Het Nieuwe Instituut, with An installation in four acts. With contributions from Kate Ascher, Guus Beumer, Piet Blom, Eleanor Bron, Vishaan Chakrabarti, Benedict Clouette, Paul Finch, Samantha Hardingham, Joop Hardy, Dirk van den Heuvel, Lada Hršak, Jeffrey Inaba, Catherine Ingraham, Jesse M. Keenan, David A. King, Andrew Laing, Steve Mullin, Jan Nauta, James Sanders, Francis Strauven, Julia Vitullo-Martin, and Piet Vollaard. Amsterdam, 26.6 x 20 cm, illustrated, 144pp, paperback.